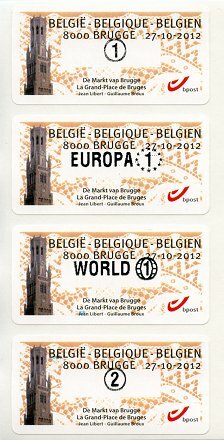 In 2011 Belgium started issuing commemorative stamps honoring famous places in the country. 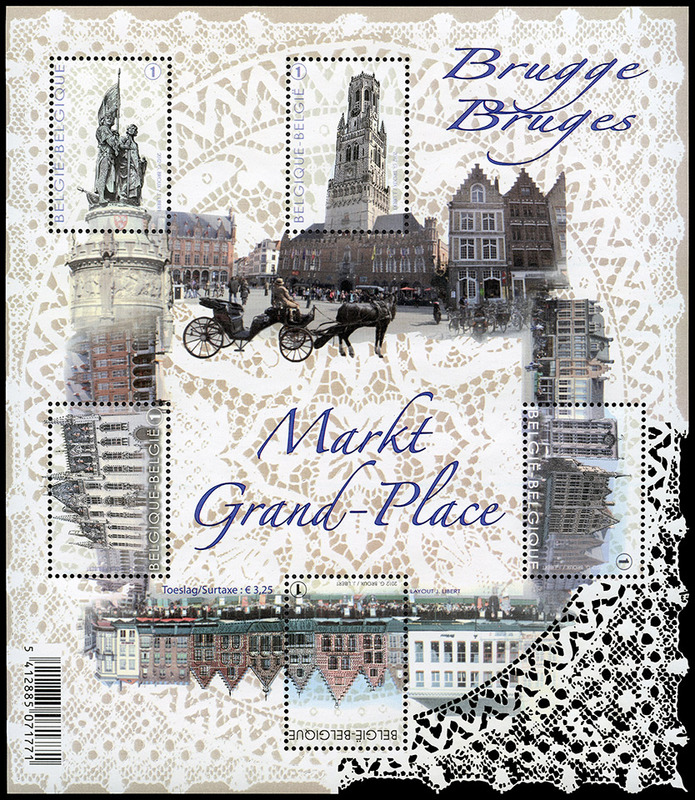 This is the second issue, depicting the market square in Brugge. The square was declared a UNESCO World Heritage Center in 2000. There are two forms of the stamp, one version released October 27, 2012, which was designed to be sold in ATM (yes, Automatic Teller Machines). The second is a sheet of 5 stamps released October 29, 2012. Both use lace as a background, and what makes the sheet truly unique is a laser cut lace corner. It is very finely done, almost overdone as if there were some unintended holes in various places. But comparing my example with others, they all seem to be the same. The issues were designed by Jean Libert and Guillaume Broux. The souvenir sheet is 16 cm x 18.5 cm. I do not have an example of the ATM version, so am not certain of the size. Face value of the sheet is 3.25 Euros. The sheet may still be available at the bpost site, and I have seen them for sale on Ebay and DelCampe. The ATM version is proving more difficult to find.